From the classic espresso to the latte macchiato, coffee speciality trends come from Italy. With the WMF 1300 you get the authentic Italian taste as well. The unique barista button now makes it even easier to satisfy your clients' individual requirements. Simply press the touch screen button to have the next coffee prepared stronger of weaker as your client desires. In addition the pre-heater function ensures that even after an extended idle time, the next espresso is always as hot. All the parts in contact with the coffee are heated to the correct temperature on command. 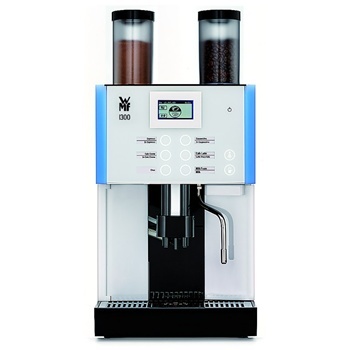 With the WMF 1300 you always get a perfect coffee... as made by a barista. Good coffee is an important cultural asset, and good coffee from the atmospheric WMF 1300 coffee machine is a real highlight. Sources of light in different colors strike a unique note in the cafe, on the bar or even at the office.